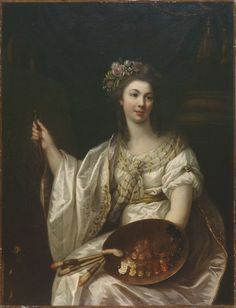 You are here: Home / Portfolio / Diane’s Paint Post! So I finally had some time to do the Paint Post on the warm tones that have been taking over the walls of the most popular decorating trends these last few years. Here I talk about which ones work, how to choose, the colors I personally love and what to strongly consider when painting. The task seems daunting to some but painting a room is one of the easiest transformations you can make. If you’re not sure if you are ready to experiment with color, start someplace small like a powder room or an accent wall. To get started select a color from a favorite piece of artwork, accent furniture, rug, accessory or even clothing in your wardrobe. Anything you love in the room can really be your inspiration. Just don’t go running into your closet to grab your favorite pumpkin colored sweater. Think about the mood you are trying to convey, is it intimate or dramatic? Look at the lighting. Is it natural sun light, task lighting or overhead? Natural light shows the best and truest color. Lighting can change everything! I get many phone calls from clients who have decided to pick a paint based on how it looks on the teeny, tiny sample card from the hardware store and then it doesn’t look at all like they envisioned once on their wall. My advice to you: Test your selection. Trust me on this one! Many paint companies (best invention ever) will sell you nifty, sample size colors and they are pretty cheap. When selecting paints with a client I usually try it on a piece of white board at least 24 x 24 and then hang it in the area where we will be painting. Color can look like it changes throughout the day, just like daylight! Look at it during the day and at night. When it is sunny and when it is overcast. Make sure that you still like at different times of the day. Also, it is very important to take into consideration the fixed articles in the room. Is there a stone surround on a fireplace, a tile floor, a granite top or a back splash? 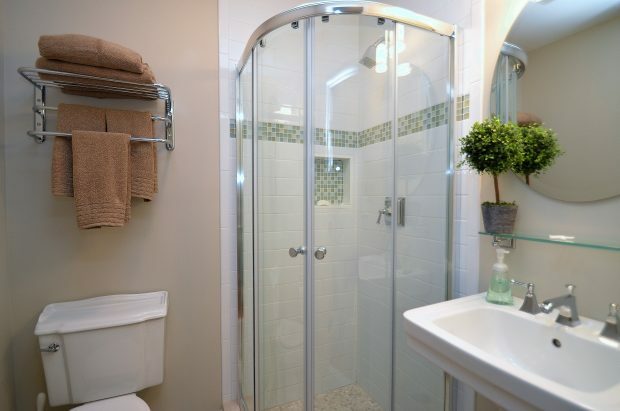 As these items are much more costly to replace, the color MUST work with the fixed articles. Also, your paint color should flow throughout the home especially if you have an open floor plan and the trim should be uniform throughout. DO NOT BE AFRAID. It’s just paint and paint and paint is not permanent. Blues and greys have been very popular over the last few years, especially for the beach inspired interiors we get to do out here in the Hamptons but they also work quite well in more contemporary and modern interiors. They are neutral yet can bring a warm, relaxed calmness to the room. Some of my favorites from Benjamin Moore are Harbor Grey, Nimbus Grey, Palladium Blue, Balboa Mist and Nantucket Fog. 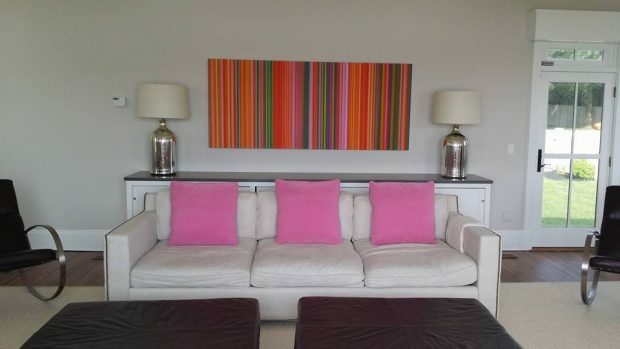 A client’s contemporary living room in Balboa Mist, which allows the fun colors to pop. 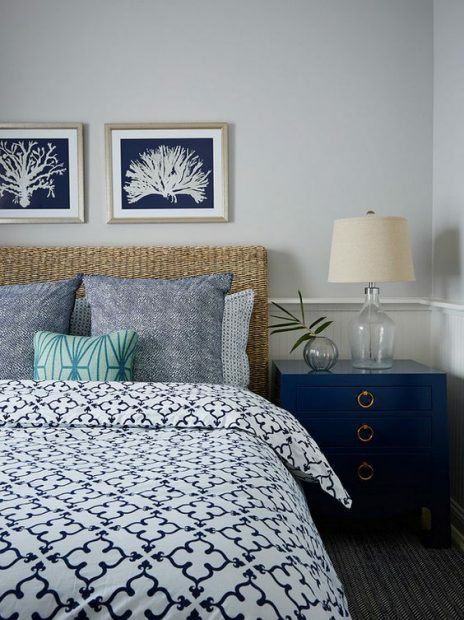 A beach bedroom in Benjamin Moore’s Harbor Gray. 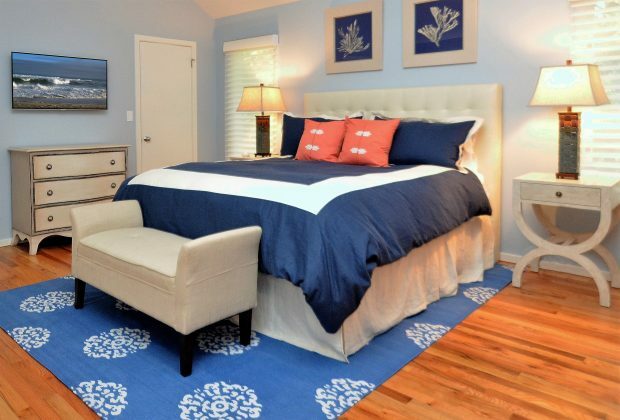 We used Gentle Gray in this client’s updated home at the beach. 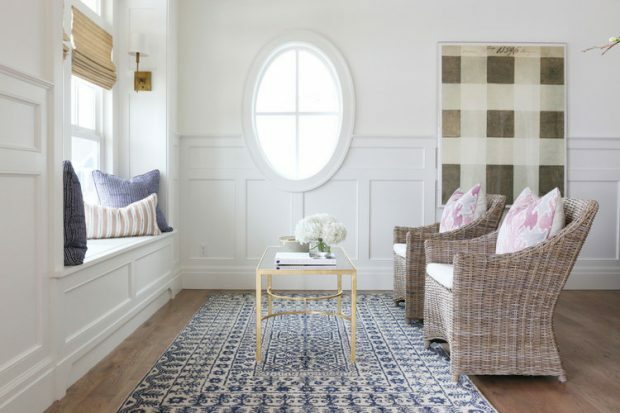 The modern farmhouse decor has become especially popular as of late. With television shows like Fixer Upper, farmhouse interiors with simple industrial pieces are increasingly favored. The look is minimal and simple but your’e not going to then throw a deep red onto the wall for this trend. That’s not the farmhouse we are talking here. 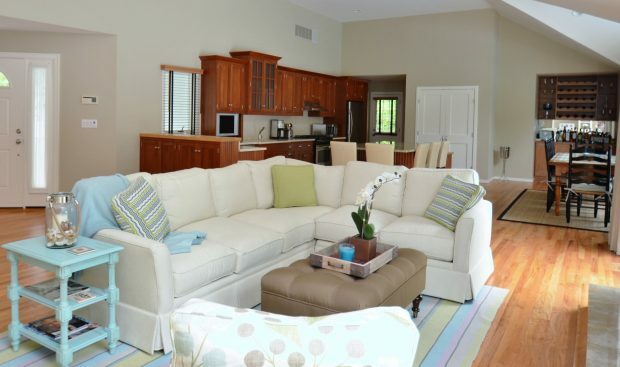 These favored paint colors carry beige-green and beige lavender undertones. I like Pale Oak, Mountain Peak White, Sweet Celadon and Collingwood from Benjamin Moore. Sherwin Williams has a Mindful Gray SW 7016, and Silver Strand SW 7057 that I also really like, and while I am a color girl, even if subtle, a clean blank palette of white has become a favored wall color (white is still a color) and frequently used are Benjamin Moore’s Simply White and Mountain Peak White, which adds to the cleanliness and polished farmhouse look so that all those neat industrial wood and iron pieces really stand out. 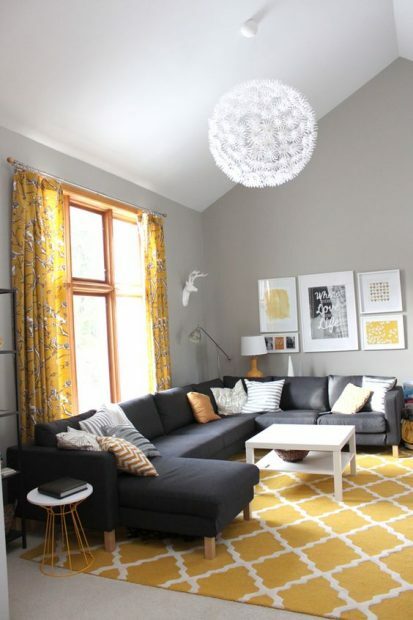 Sherwin Williams Mindful Gray from Young House Love. 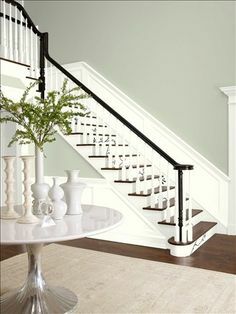 Came across this lovely Sweet Celadon from Benjamin Moore while trolling Pinterest. Going Greige. Lastly, is the new word greige you may have heard about- a combination of grey and beige that are actually quite lovely. 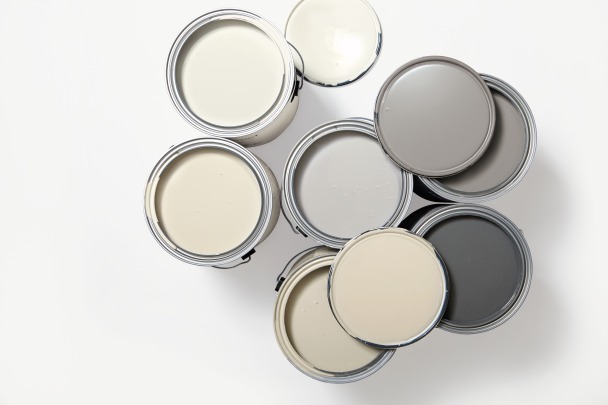 Several colors from Sherwin Williams are going greige like Repose Gray, Analytical Gray, Dorian Gray, Agreeable Gray. 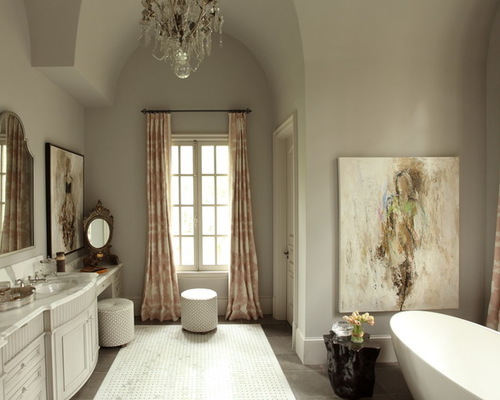 Other options from Benjamin Moore are Hazy Skies, Edgecomb Gray, Bleeker Beige, and Farrow and Ball’s Pavillion Gray . 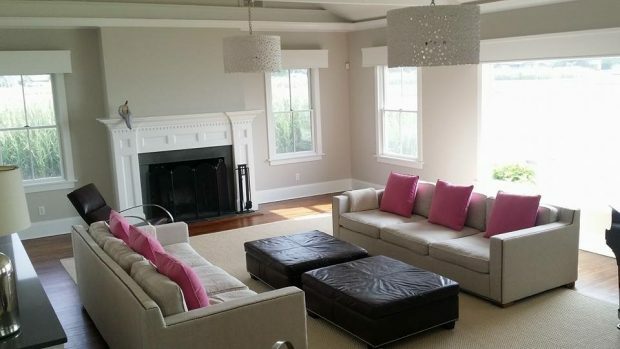 A renovated beach house in Benjamin Moore’s Bleeker Beige. Farrow & Ball Pavillion Gray in this pretty room. Edgecomb Gray in small bath. THE FINE PRINT. Keep in mind when choosing paints and looking at photographs on line or even in print (including my own) that the paint colors are most always not an exact match. Remember my little rant on considering lighting and everything else around? This also applies to a paint you see in a picture. There are always shadows, lighting and picture quality that has either been tampered with for clarity and will most definitely not always convey the true color. Hope this was helpful. As always, reach out to me for questions and I will try to get to them all. Previous Post: « The Best in Business Voting Has Begun!